July 12, 2018, 10:33 a.m.
Who wants to live forever? The question was asked most memorably by the band Queen back in 1986, but is also now a subject of enquiry at the V&A’s “The Future Starts Here” exhibition (of which YouGov is a partner organisation). Obviously growing old at present has significant downsides, namely the deterioration of physical and mental capacity, and it is not likely that many people would want to live forever under such circumstances. But what if the aging process could be halted, and good physical and mental health could be guaranteed: how many Britons would want immortality? 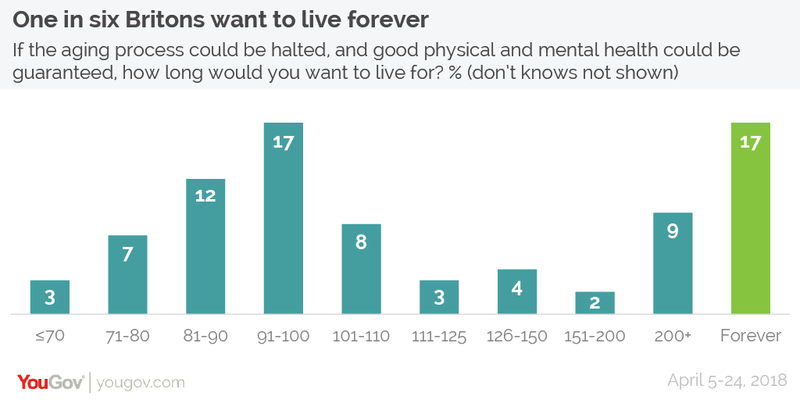 Under such conditions one in six Britons (17%) say they would want to live forever. Men are noticeably more likely than women to want to live forever: 21% vs 12%. Perhaps unsurprisingly, younger people are the most keen on extended life spans. One in eight 18-24 year olds (13%) want to live to be older than 200, and 17% want to live forever (and those figures are even higher among 25-34 year olds: 15% and 23% respectively). Among those aged 65 and older, however, only 5% wanted to be 200 or older and just 10% want to live forever. Even under the conditions listed above a total of 40% of Brits wouldn’t want to make it past 100 years of age. A further 24% want to live for longer than a century but don’t want to live forever. Of the six attitudinal groups YouGov has identified, only one has views that are particularly different from the population as a whole: Tech Disciples are noticeably more likely to say they want to live forever (30%, compared to 17% for all Britons). Tech Disciples are also more likely to want to live for two centuries or more 14% (vs 9% of the whole population).